At TU/e Smart Mobility we see many opportunities to use the potential of technology to solve the problems of mobility by adding smartness to it aiming to decrease these negative effects down to 0%. Within the Smart Mobility track of the Honors Academy we would like to challenge you to develop yourself in generating out-of-the-box ground breaking new mobility concepts. 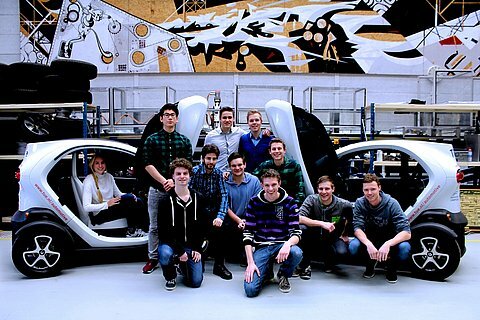 In last two years the honors students in the smart mobility track have worked together on the design of an automated system of autonomous cars for the city of Eindhoven, on the aspects of design of the overall urban mobility system, the business plan, the App design, the digital world representation and vehicle control. The team consists of students from quite different disciplines: built environment, mechanical engineering, industrial engineering, industrial design and informatics. For the team a Renault Twizy is available for implementing core technologies and doing experiments with user focus groups. The coming year this project may be enhanced with other aspects. The digital world representation by a highly accurate map and real time positioning beyond GPS capabilities is one of the topics to be enhanced towards the next level. We might also have the possibility to use a public transport coach, which could be redesigned into a system for combined urban goods and person transport and thus fit into the overall urban mobility system. But we are also challenging you to come up with new concepts based upon the future situation that the information economy enters the mobility area. The exchange of traffic information and car position through individual car navigation devices, for example, is turning traffic management into a self-steering system of well-informed individuals. Drivers follow up their own device rather than public traffic signs. Another example is the introduction of the taxi App, which enables people to have direct contact with a taxi driver of their choice. As a result, taxi switchboards no longer seem to be required. How will the availability of the Internet affect how people will move from one place to the other, when they do so and where they go to? In retail the classic shop-model is quickly losing importance. People buying via Internet means a total shift in the logistical value chain. Or what if people start 3D-printing their own stuff? The current system where several vans deliver one package each to a cyber-customer is far from optimal, so must and will change. What will happen in the future? People’s future work and leisure time are totally different from what they used to be and much more intertwined. More flexibility means people are adapting their travelling pattern. When all information is available explicitly, will we still have a congestion problem? What are scenarios for "the future trip"? The increasing urbanization challenges new transportation solutions. Vehicles might be inherently safe and non-polluting in the future, but they still need square meters, space that in the meantime is getting less available. How will this move from owning a car to using a car being managed in an automated system? Or won’t we use a car in the future anymore? What other consequences of new developments, opportunities and risks can you come up with when information on the one hand and mobility and traffic on the other hand merge even further, especially the ones that at this moment nobody is seeing?